I have just one goal for NaSpiMoMo: SPIN. It’s been hard to get to it this month, but at last, today was the day. My observation: I like quiet when I am spinning. I don’t need music, television is distracting, and frankly, what’s running through my head is noise enough. I don’t sit down at a wheel with pure concentration in mind, but I suppose quiet helps me focus. I do sometimes listen to a book as I spin, but more often than not it’s silent except for the whirring of the wheel. Speaking of whirring, I made another observation: the Reeves makes a very nice little schooshing sound when the drive band leaves the wheel. It’s not rubbing anything, just moving from the big wheel, across itself, and on to the flyer. Nice. I’m working on some camel-tussah roving. It’s the same yarn I’ve been working on since last year. If it existed, I’d join NaSpiMoYe. I’m almost finished with the baby bonnet that I started the other day. It took a while to get the I-cord to look the way I wanted it to; Kay’s I-cord technique saved the day. I’ll make a pair of booties, block the hat, and this gift will be ready to send to my niece before her babe arrives. Baby bonnet observation: I will forever imagine this little one wearing a tea cozy on her head! My Palindrome scarf is finished and blocking. 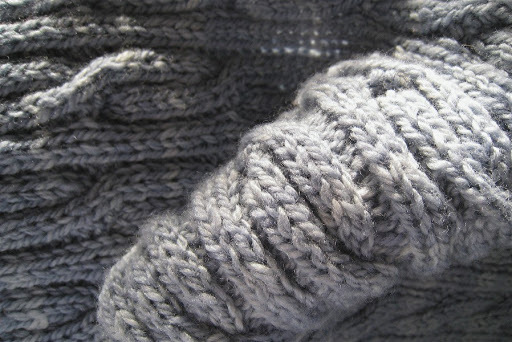 It is such a beautiful color, and I love the way the yarn looks in cables, even these simple ones. It’s so soft and luxurious! Scarf observation: If I were persnickety, I’d be bugged by the way reversible cables (or at least these, in K2P2 ribbing) are off-kilter. The cables aren’t set into a background, so they don’t stand alone. I don’t mind; this is a scarf that is reversible, for goodness sake, and it will spend its time wrapping me up and keeping me warm. Since I didn’t couldn’t get enough of hanging around the house last week (I’m feeling much better, thanks to rest and everyone who sent good thoughts) (and my sheepy pj’s came from Macy’s, Chris!) I’m taking tomorrow off, too. I plan on doing more spinning, more knitting, a little de-cluttering, and there’s a birthday dinner for Judy in the evening. That’s plenty for one holiday. Oh, I haven’t seen those particular sheepy pjs before. 🙂 Your spinning is very earthy looking – good colors for the cold winter! What does: NaSpiMoYe mean? 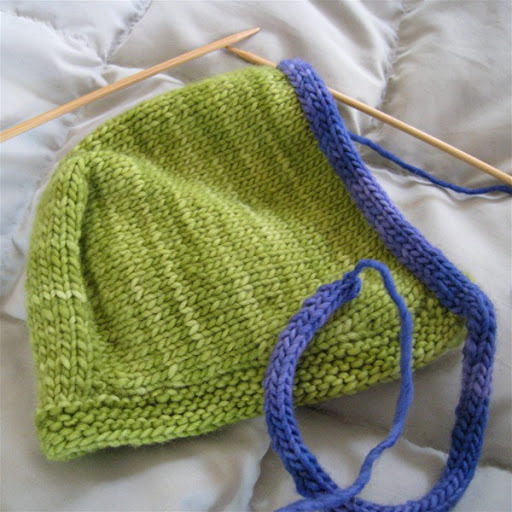 I have seen it before and forget… Your sppinning is so even for not doing it for a year – I am terrible at spinning – too tight a grip!Love the bonnet too… Enjoy your extra day off! your spinning is looking wonderful.and I totally understand what you mean about it being nice to spin in the quiet…………. just the rhythm of the wheel is enough to soothe the soul. Sounds perfect. Moonroot, one of my favorite real life friends and bloggers (she lives in Wales) wrote a post about luxuries. Is spinning a luxury? Or an art? Or … ?? What does spinning do to the way you think? I think I need a NaSpiMoYe too. One month just isn’t going to do it. My favorite time to spin is when the house is quiet and it’s just me and the wheel. 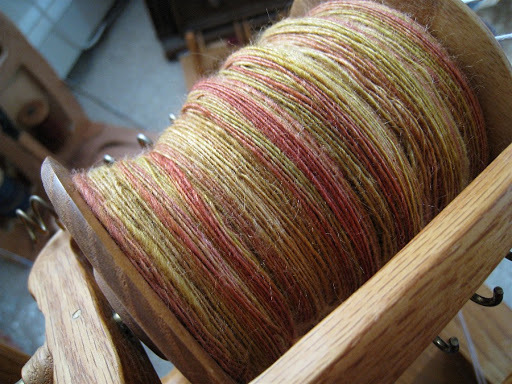 The colors in the camel-tussah roving look nice and warm. Glad to hear that you’re feeling better. What a lucky baby to receive such a sweet bonnet! I’m glad you’re healing well, and I love the socks and hat! And the PJs. I should spin more now that my blanket is done, yes indeedy. But Jane, it’s auch a sweet little hat and nothing like a tea cozy. :-)You are getting better, too. Yay!I love things to be quiet when doing most things, and spinning is really the quietest time for me, besides sleeping that is. 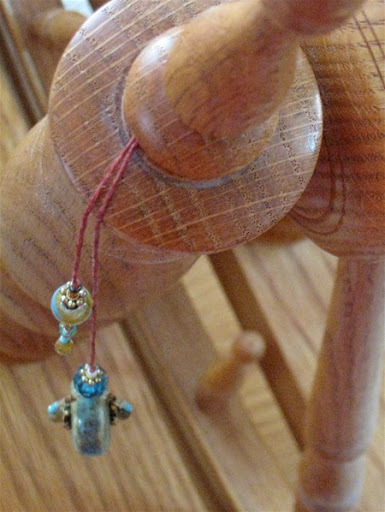 Beautiful pictures and beautiful spinnings.